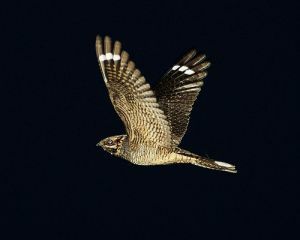 Local naturalist Keith Gittens, is back with our next adventure into the lives of the Nightjar! And this time we will be making a night of it with a curry (not too hot) at the Village Hall before we leave. "Nightjars migrate to the UK each summer to breed. They arrive in May and leave by August. Their distinctive churring can be heard at dusk as the males establish territories and look to attract a mate. They continue to churr throughout the summer. The birds natural habitat is open heathland with some tall trees, but they have also established themselves in areas of forest on the North York Moors where there is a mixture of forest plantation and clear fell. The birds nest on the ground in the clear fell areas, feeding over young plantation and males use the taller trees from which to make their distinctive call. By visiting such forest habitat at dusk we will listen for the churring and also look for birds flying and feeding. Nightjars feed on flying insects especially moths which they catch on the wing at night with wide gaping mouths." Saturday 22nd July, 7.30pm. Meet and eat at the Village Hall. Own transport required (preferably car share) to travel to local listening spot! Churring from approx. 9.45pm till 10.30pm but it's difficult to be exact! Warm clothes and insect repellent advised. Tickets £10 per person. Includes curry, drinks available to purchase from the bar and commentary on nightjar activity.